A lot of business owners start with little or no money. They have to do everything themselves — product development, coming up with a marketing strategy, building of a website to help market their products or services. As their business grows, they will find that a simple “homemade” site might not be enough to meet their needs, and they will have to set aside time to revisit their web strategy and expand their site. Sounds familiar? Chances are, you’re someone who started your business from the ground up too, so you’re pretty hesitant when it comes to spending your money for something you could probably do yourself. However, there is a lot more benefit to hiring a professional designer than just handling a job that you don’t have time to do. When you hire a web designer to do your job for you, you are doing more than just handing over the work to someone else. In fact, by paying just a little money, you can let the designer worry about the little annoyances that always evade the main picture and only come haunting when you’re halfway through the job. Hiring a web designer will allow you to be more focused and have more time to spend on your actual business strategy. On the other hand, the designers you hire are professionals so they are good at what they do. By outsourcing your web design jobs to them, you won’t have to worry when problems surface because you can always get them to fix it for you. Again, they will be able to pin point the problem and fix it faster than you probably will be able to. Web design is more than a pretty package in which to write your words. There are many small details that can make or break your website. Here are five simple rules that will boost your website’s performance and have visitors coming back for more. When a person arrives at your website, they want to see information. They don’t want to see a pretty image where they have to click again just to enter the site. Splash pages might look pretty, but they serve no real purpose other than to annoy your visitors. Even those who don’t use the net much have learned to ignore banner ads. Occasionally, a strategically placed banner will draw someone in, but too many are more likely to scare them away. Don’t waste this valuable space. Use it instead to offer your visitors a reason to stay longer or buy from you! Don’t try to push them with loud flashy banners. Don’t make it too hard for your visitors to find what they are looking for. Reduce the number of clicks needed to get what they want. Don’t make them hunt for something by hiding it four levels down inside your website. People want information now! They don’t want to have to hunt for it. Visitors will want to know where they are as they’re browsing your website. You don’t want to confuse them with disorganization and no labels. A confused visitor is one who is more likely to quit reading and go somewhere else for their information. If you want your visitors to stay at your site for a long time, you don’t want to annoy them with looping audio. You want them to be reading your content, not clicking the back button. If you really want to use audio, make sure your visitors can control it – muting or volume controls should be sufficient. You don’t want anyone to blame YOU for getting them in trouble for browsing the internet at work! 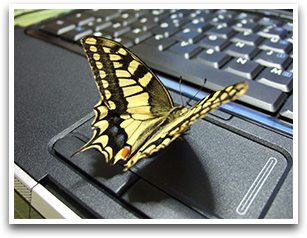 Mariposa Web Design in offering free hosting for one year with the purchase of any new website design. Hosting is a sometimes forgotten expense when trying to get your business on the web. A hosting account is like virtual real estate. It’s a piece of property that you rent where you can place your website for people to see. Without hosting, there is no way for people to find your website. There are so many hosting companies available, that choosing one can be a confusing and daunting task. Mariposa Web Design makes it easy by offering free website hosting for the first year for customers buying a regularly priced design package. That’s a savings of $47.88! Getting a new website doesn’t need to be complicated. Contact me to find out more about what I can do for you and your business. Finding the right web hosting service provider for you can be overwhelming and frustrating. Maybe you’re not sure how much space and bandwidth you need. Maybe you don’t even know what bandwidth is! I am here to help by reviewing some of the service providers I have used for the past few years. Host Gator is my current hosting provider for all of my sites. The unlimited websites option is what attracted me. Their regular hosting plans start at $4.95 per month for one domain. You can bump that up easily to unlimited domains for only $7.95 per month. Still a reasonable price for a valuable service. The business account starts at $12.95 per month. Host Gator offers a number of extra perks for their business customers: Free SSL certificate on the primary domain. Also you can get a free toll free number for your business. Reliability has been very good. I have not had any experience with customer service yet. I will soon when I install the SSL on my domain. I’ll post an update on customer service when I can! My only complaint is I wish I could put the free SSL certificate on a different domain. I don’t need it on my primary domain. I can still get one, but I have to pay for it. I first learned about Host Nine through my employer at my part time job. The experience I have with Host Nine is with their reseller account. The reseller account is an excellent program where for a very reasonable monthly fee, you can sell hosting accounts under your own name. The profits are yours to keep. Host Nine is not only a reliable host, they also offer one of the best reseller plans. They’re offering an unlimited hosting plan for $6.95 a month. There is no contract to sign. You can host unlimited domains and have unlimited bandwidth and storage. Up time has been 100% since we joined Host Nine. Customer service is fairly prompt by email or phone. My only complaint with Host Nine is the occasional technical glitch when I create more than one new account at a time. The positive in this is customer service takes care of it right away for me. With the reseller plan, since it’s shared hosting, there are times when I can’t create an account in a certain area because that location is full. I’m forced to create it on a server elsewhere. That’s only a slight inconvenience as long as the customer doesn’t care whether his site is hosted in New York or Texas. Customer service is fast and effective. They offer a variety of service levels to fit your needs. As low as $4.24 per month. There is no setup fee. They offer 24/7 support. You can purchase plans with up to unlimited storage and bandwidth. With a virtual dedicated server, you have full control over your server space. Up to 50GB in storage and 2000GB in bandwidth. Prices for virtual dedicated servers start at $23.99 a month. With a dedicated server, you can customize and configure your own server. A dedicated server is great for high traffic applications like gaming and multimedia websites. Prices for dedicated servers start at $63.99 a month. Click for more info on any of these packages. My experience with them was a mostly positive one. While I have been testing the waters with other hosting providers, I still use Godaddy as my primary registrar. My only complaints with Godaddy are what I think are overly aggressive sales tactics and the customer service number is not toll free. Since I use my cell phone for calls anyway, toll free doesn’t really matter to me. More recently, I’ve seen issues with running scripts. Not all of their hosting plans allow scripts, which severely limits what I can do with a website. I’m not familiar with their higher level plans to know if and when scripts become available. This is a definite drawback to their service, especially when I can run scripts with other hosting companies for the same low prices.